Click here to read my first trimester post if you haven’t already! 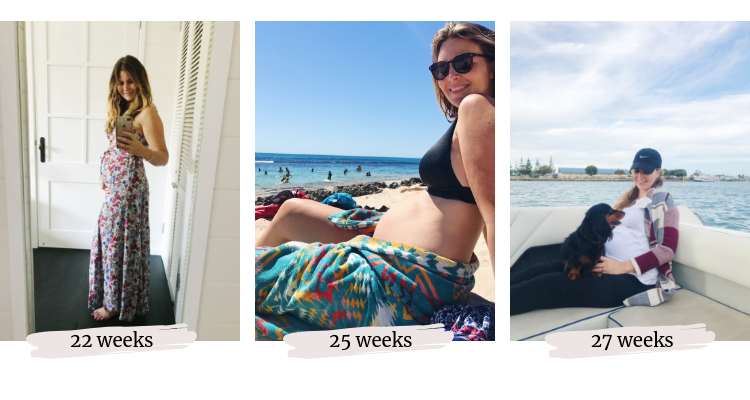 Moving into my second trimester of pregnancy felt great for a number of reasons - it’s a relief to get past the 12 week mark where the risk of miscarriage drops significantly and to be out of the thick of the tiredness and nausea of my first trimester. We also found out we were having a boy at 12 weeks (we did the Harmony NIPT blood test) which was super exciting and got to see bub kicking around in a scan at 13 weeks. At 19.5 weeks we had our anatomy scan which is far more in depth than any other scans and we got a good look at bub and it was all good news - all the right bits in all the right places! With every scan there’s so much excitement (and a few nerves on the day!) and it’s always super reassuring to see that bub is developing as he should be and get a look at his cute profile and toes. From 12 weeks I started to feel so much better - less nausea and tiredness, and by 14 weeks I felt like superwoman! I had so much energy and it was just so nice feeling like myself again. I could get back into exercise - I’ve been loving mixing it up between several different low impact options including yoga, swimming, walking, pilates, light cardio and light weights. I love these BabyFit by Amy home workouts, especially when I’m short on time. With my energy back to normal I could finally work full days again and it was so nice feeling my motivation come back in full force after weeks or really just doing the bare minimum to get by in every area of my life! From about 22 weeks I noticed my energy start to decrease a little - nothing dramatic but I started sleeping for 9-10 hours each night and occasionally needing afternoon naps (or falling asleep in my meditations!). After blood tests at 27 weeks showed my iron was super low, I have a feeling this is when it started to dip so in future pregnancies I’ll supplement with iron sooner and make more of an effort to eat an iron rich diet and hopefully keep that second trimester energy going even longer! By far my favourite part of the second trimester has been seeing my bump grow and feeling our little guy kicking around! I’ve been feeling flutters (like little scratchy tickles in my tummy) from 14 weeks but I felt our baby properly kick for the first time at exactly 21 weeks when I woke up in the middle of the night and it felt like I had bubbles popping in my tummy! When I put my hand on my belly I could feel the little kicks and got so excited I woke Trav up so he could feel too. It’s so nice for him to be able to feel the bub and I think it makes it even more real for him! My Baby Centre pregnancy app (which I highly recommend if you’re pregnant!) told me that bub can hear from about 22 weeks so when we were on our babymoon in Byron I found a lovely book (Kissed by the Moon by Alison Lester) that we’ve been reading to bub every night and then singing him Twinkle Twinkle Little Star. The idea is that these familiar sounds and rhythms will be comforting to bub when he’s earthside and it’s a really lovely bedtime ritual for Trav and I as well, especially because bub is super active in the evening and we can feeling him kicking away while we lie in bed. I’ve been gradually collecting baby bits and pieces as hand me downs and from Gumtree - even though we’re aiming to get minimal stuff for bub there’s still quite a lot to buy! So many baby items you only need for a short period so it feels really good and less consumerism-y to buy second hand and there’s so much around that’s in great condition. I’ve scored a great Ergo baby carrier and Baby Jogger City Mini GT pram from Gumtree and a bassinet, clothes, breast pump, and baby bath from friends. The only thing I’ve bought new are some clothes (they’re so CUTE I couldn’t help myself!) and we’ve bought a new car seat, cot and mattress new for safety’s sake. I’ll do another post down the track with newborn + baby prep must haves once I see what we actually use all the time! When I was 21 weeks pregnant we spent a week in Byron Bay as our baby moon (any excuse for a holiday right!) enjoying the beaches, swimming holes and yummy food. I’ve created a highlight on my Instagram @amelia_harvey_ called ‘Byron Babymoon’ with details on where we stayed, explored and ate if you’re interested! Byron was a great place for a babymoon as it was super chilled and it’s such a beautiful part of the world. I didn’t feel comfortable going overseas because of things like the Zika virus or just in case we needed to see a doctor but wherever you go I’d recommend heading somewhere you can float in the ocean or pool for a couple of hours a day - heaven! I’m so glad we took our holiday when I was 21 weeks - now that I’m 28 weeks I’m getting a few more aches and pains that would have made flying less fun and I’m finding I’m much more sensitive to heat and getting tired more easily. If you’re tossing up when to holiday during pregnancy I’d say any time between 14-25 weeks is prime time, in my experience anyway! As my bump started to grow I’ve had a little bit of back pain that I see an Osteopath for and some intercostal (rib) pain which is a dull ache around my bottom few ribs as everything shifts to make room for bub! I’ve been seeing an osteo for a few years now and I can’t recommend them enough, I always feel so much better after my appointments (where they do a mixture of soft tissue and skeletal work) and I’d say a great osteo, physio or chiro is a must for a pregnancy! Pregnancy massages are absolute heaven for those aches and pains as well, I had a lovely one at Comma in Byron on our babymoon and just recently had the most relaxing massage of my life at Limon Spa in Leederville. If there’s ever a time to treat yourself, pregnancy would be it! On New Years Day I woke up with a sharp pain in my abdomen - it felt like I’d torn an ab muscle and the area was very tender to touch. I called my midwife and explained how I was feeling and she told me it sounded like textbook round ligament pain - basically the ligaments surrounding my uterus were stretching as my belly was growing. I spent most of the day in bed where I was most comfortable and by the evening the pain was pretty much gone which was a huge relief. It’s come back since but much more briefly and much more mild - perhaps because I now know what it is now and don’t freak out! Something I’ve found a little tricky being pregnant is what I can wear! When my bump was smaller, some normal clothes became too tight but anything maternity would look like a tent on me! I also don’t want to buy a whole heap of maternity clothes that I’ll only really wear for a few months if that. Being pregnant in the warmer months, flowy non-maternity dresses have been my go-to, I picked up several from Auguste early in my pregnancy and they’ve been on high rotation! The only actual maternity clothes I’ve bought are exercise tights and shorts, lounge pants, a pair of maternity jeans, a maternity one-piece swimsuit for swimming laps and some bras, otherwise I’ve been able to work with flowy or stretchy clothes from my usual wardrobe. Hopefully this will get me though my third trimester as well! Stay tuned for my third trimester post where I’ll share how I’m preparing mentally, emotionally, and physically for birth and the arrival of our bub.